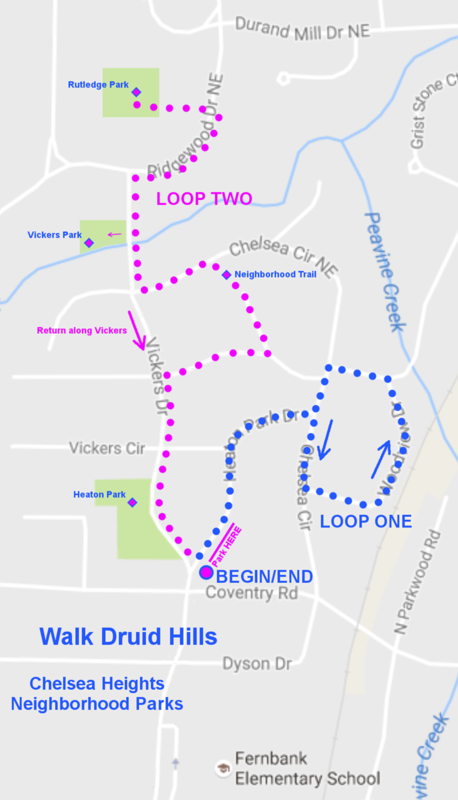 Walk Druid Hills sets out to explore the Chelsea Heights section of Druid Hills on Saturday, October 8th at 9:00 AM. The terrain on this exploration of neighborhood parks is hilly and limited in sidewalks, but worth the effort to explore Heaton Park, O.L. Adams Park, Vickers Park, Rutledge Park and a few other highlights along the way. The walk totals just under 3 miles. Park your cars on Heaton Park Dr. near the intersection with Vickers Dr.